The focus is "Dancing with Passion to the Music," with the intent to activate the hips, head and heart. ¡Bailando! is a lively routine spotlighting dance, friendship, and connection. The music for this routine is a fun mix of Latin-inspired rhythms that motivate the Nia 52 Moves as well as challenge the brain with new patterns. Bailando inspires you to let loose and blend movement with magic, expressing sensuality and strength in your dance. 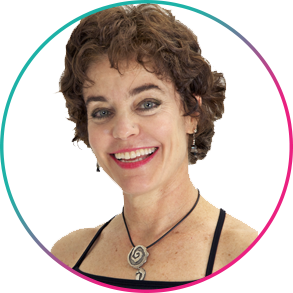 Guitaria - Deep Dive Corp.
Adelle shares her 40 years of passion and love for teaching movement, breath, yoga, music therapy, meditation, and community connection.